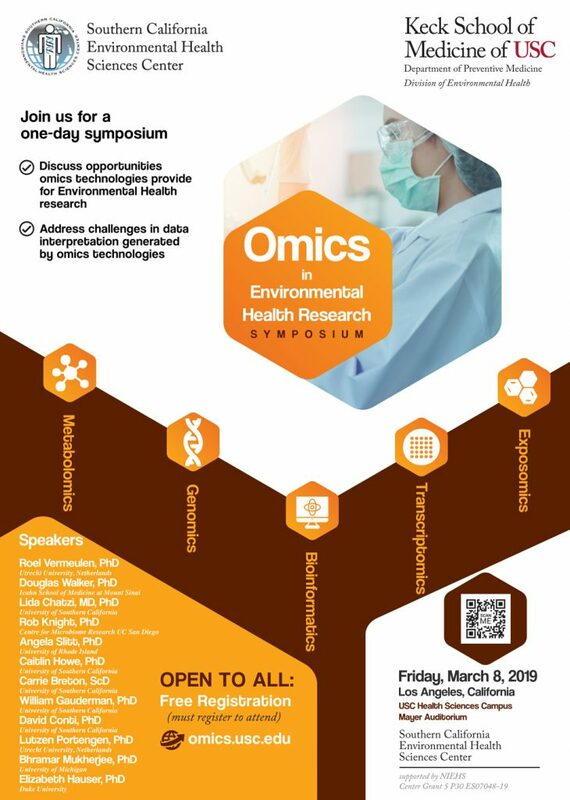 Join us for a one-day symposium, hosted by our NIEHS funded Southern California Environmental Health Sciences Center at the University of Southern California. Omics technologies are new biomarker discovery tools that can be applied to study large sets of biological molecules. Their application in human population studies has become feasible in recent years due to the recent and spectacular increase in sensitivity, resolution, and high throughput of analytical assays now possible. Although the number of omics techniques is ever-expanding, their application in Environmental Health research has been limited thus far. During this one-day symposium, we’ll discuss opportunities these new technologies provide for Environmental Health Research. We’ll address challenges in data interpretation generated by omics technologies. We’ll provide examples of studies leveraging omics technologies to investigate health effects of common environmental exposures. We’ll also discuss how the complex mix of environmental exposures (exposome) shapes human health through changes in the “metabolome” and gut microbiome. We’ll highlight large consortia initiatives which enable applications of omics technologies in environmental health research. No-cost registration is required, and a lite breakfast and box lunch will be provided. Register soon, capacity is limited! 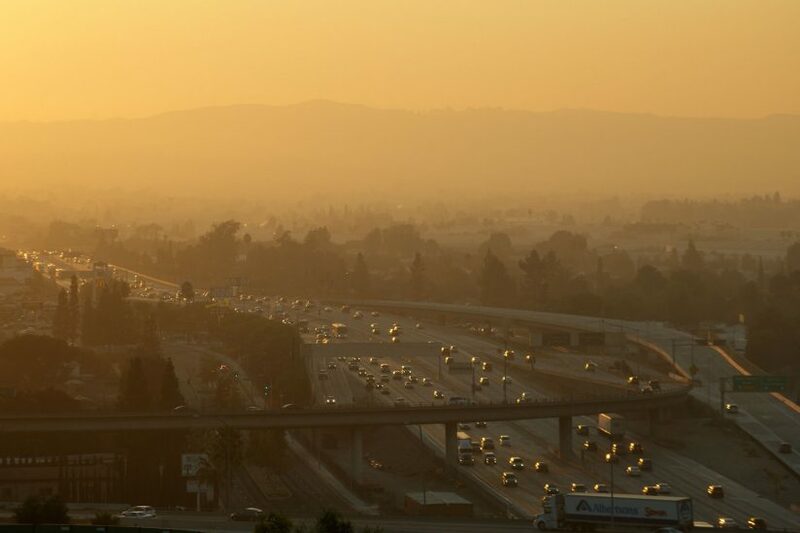 A recent research study by Dr. Rima Habre took a detailed look at the short-term health impacts caused by breathing in ultrafine particulate (UFP) matter that is emitted from aircraft activity at the Los Angeles International Airport (LAX). Several years ago, USC researchers identified a clear pattern of UFP emissions from takeoff and landing aircraft activities at LAX. Levels of the dangerous UFPs were found to be 4 to 5 times greater than background levels in downwind communities. “Ultrafine particulate matter is known to contribute to reduced lung function, and airway inflammation in individuals with asthma. We wanted to take a close look at short term effects on health when individuals breathe air that contains UFPs from airplanes,” said Habre. The study participants were made up of adults with doctor diagnosed asthma. 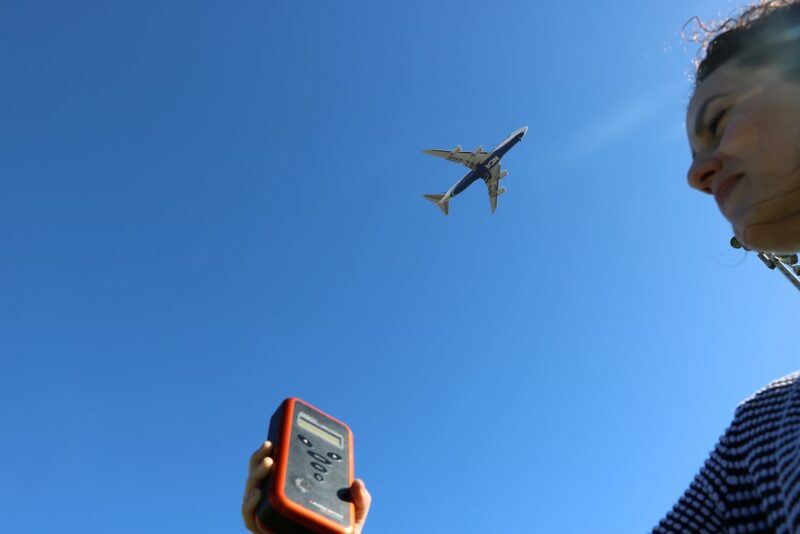 Rima Habre holds an ultrafine particle monitor monitor while a plane flies overhead. Photo courtesy of Something in the Air documentary. Dr. Rima Habre has been with USC for five years. Dr. Habre’s expertise lies in air pollution exposure assessment, analyzing patterns of how people get exposed to air pollution across time and space and studying how specific pollutants impact their health. Recently Dr. Habre’s work reached the international stage through a documentary, produced by the Canadian Broadcasting Company, called Something in the Air. “The producers were very interested in learning more about our latest work around air pollution and asthma – specifically around the latest technologies we are using to better understand the impacts of small particles on a personal level – in children and adults with asthma, and in pregnant women.” Dr. Habre was interviewed about her work around ultrafine particle exposures downwind of major airports and its effects on asthma, as well as her work to understand how children’s personal exposure to air pollution predict their risk of experiencing an asthma attack. Something in the Air will be released this week in Canada, with an international release to be announced. Habre and her team designed this study to test the short-term effects of breathing ultrafine particles by asking study participants to walk in a Los Angeles park located within the known higher levels of UFPs emitted from airplanes and near heavily trafficked roads, and another park farther away from the airport and busy roads with lower levels of UFPs. The map above shows the two parks where the study took place. 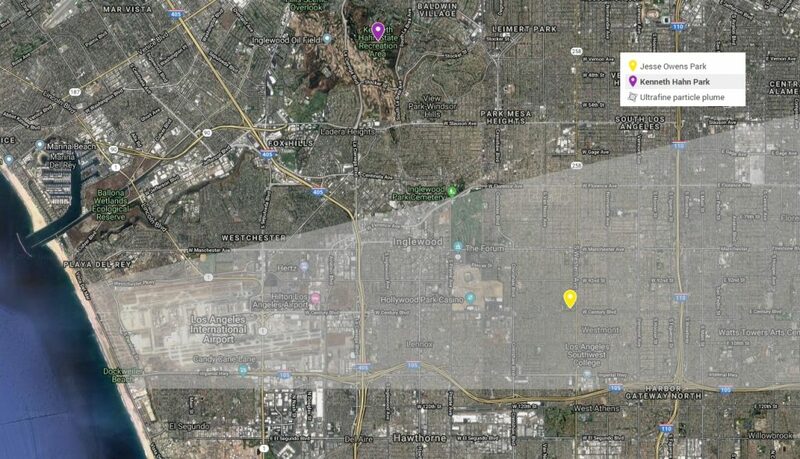 The grey shaded area shows the approximate location of the plume of ultrafine particles created by air traffic around LAX, that usually occurs when the winds are blowing steadily from the West. “In our study, we found that inhaling UFPs led to higher inflammation in the blood in adults with asthma shortly after exposure. However, different inflammation markers responded to aircraft-related versus traffic-related UFPs – both of which are major ultrafine particle sources in dense urban areas. We were able to see these different signals because we managed to overcome the challenge of separating the air pollution mixture into its major sources using sophisticated measurements and modeling techniques,” said Habre. The pollutants measured by the study included UFP particle number, particle size, black carbon, carbon dioxide, particle-bound polyaromatic hydrocarbons, and ozone. The significance of Habre’s study is that in such a short time, following regular walking exposure and a higher exposure, they were able to see significant elevation in inflammation systemically, not just in the lungs but in the overall blood circulation. Inflammation is tied to a lot of disease processes; cardiovascular, respiratory, and metabolic. “We don’t know specifically what this inflammation will lead to down the line, but we know that inflammation is generally a bad thing, and will complicate or exacerbate existing conditions. Ideally, we would have liked to have been able to monitor people long-term to see if that inflammation persists or if it goes down after a while but we were not able to do that in this specific study, that’s a future direction of this research I’d like to look at,” said Habre. When asked what this research means to the overall population, Habre described the current body of research that has found ultrafine particles to be much more toxic than the larger sizes of particulate matter, UFPs are not regulated, and UFPs impact large numbers of people who live in communities surrounding airports. As she moves forward with her research on the health effects of ultrafine particulate matter in urban areas, Dr. Habre plans to build on her current work by studying how people with asthma are affected, as well as those who are obese, have diabetes, or cardiovascular issues. “I would like to be able to capture a wider variety of sources of ultrafines in urban areas and also be able to monitor individuals for a longer period of time to really understand what happens next. In this study we saw very quick and acute effects, but do people tend to recover after a day? I think the ultimate goal would be to really understand if people living in these high exposure locations, for extended periods of time, and breathing this mixture in regularly are at a significantly higher risk or not,” she said. For more information on the “Something in the Air” documentary that Dr. Habre’s work is featured in, on the documentary’s website: www.somethingintheair.ca. Once the documentary is released in the United States, USC Environmental Health Centers will publish the release date and viewing information. Funding: This study was funded by the Southern California Environmental Health Sciences Center (National Institute of Environmental Health Sciences, P30ES007048) pilot program, NIEHS grants 1R01ES023262, 1K22ES022987, 1R01ES027860, and the Hastings Foundation. 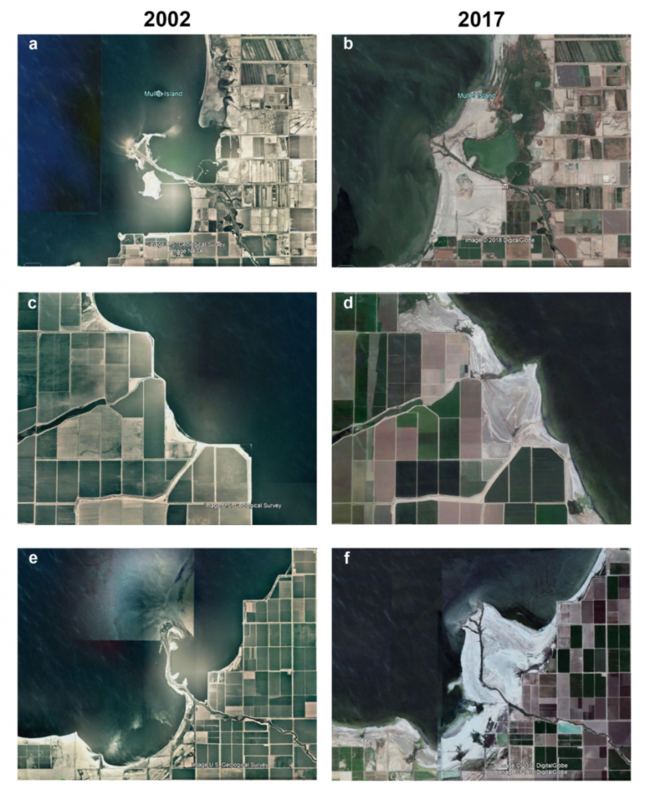 Researchers and community partners of the USC Children’s AIRE study recently published a paper that summarizes the public health dimensions of a shrinking Salton Sea. Competing water demands in the southwest are dramatically altering the landscape and creating conditions conducive to the production of wind-blown dust and dust storms in this region. “Children are highly susceptible to the impacts of air pollutants, as their lungs and immune systems continue to develop throughout childhood. Studies show that wind-blown dust may adversely impact respiratory health and these effects by be amplified in environmental justice communities” said Jill Johnston. The authors highlight the need for meaningful collaboration across government, researchers and the community residents to facilitate the development of both mitigation and adaptive measures to respond to the shrinking Sea. Learn more about the AIRE Study including study partner Comite Civico del Valle, Inc. at the study website here. Recently researchers Meredith Franklin and Jill Johnston from the Keck School of Medicine, and colleagues published a study that demonstrates a new way of identifying oil and gas flaring sites using satellite observations. This will go a long way in more accurately identifying and characterizing the public health impacts of exposure to flares, which contain a variety of harmful air toxics that can be released over days and years. Flaring is a widely used practice for the disposal of natural gas through burning. The practice of flaring near unconventional oil and gas extraction sites has become much more common in the U.S. in recent years. Flares often burn continually for weeks, and they are highly visible so nearby residents often complain of odors and noise. For this study, the researchers focused their analysis on one of the most productive oil and gas regions in the United States, the Eagle Ford Shale in southern and central Texas. The analysis identified 43887 distinct oil and gas flares in the Eagle For from 2012 to 2016, with a peak in activity in 2014 and an estimated 4.5 billion cubic meters of total gas volume flared. While on a much smaller scale, flaring occurs in Los Angeles, where oil and gas wells are embedded in neighborhoods and commercial parts of the city. Residents living in close proximity to oil and gas activity can be exposed to potentially harmful air pollution and can experience disruption from noise and nuisance of the equipment and rigs. 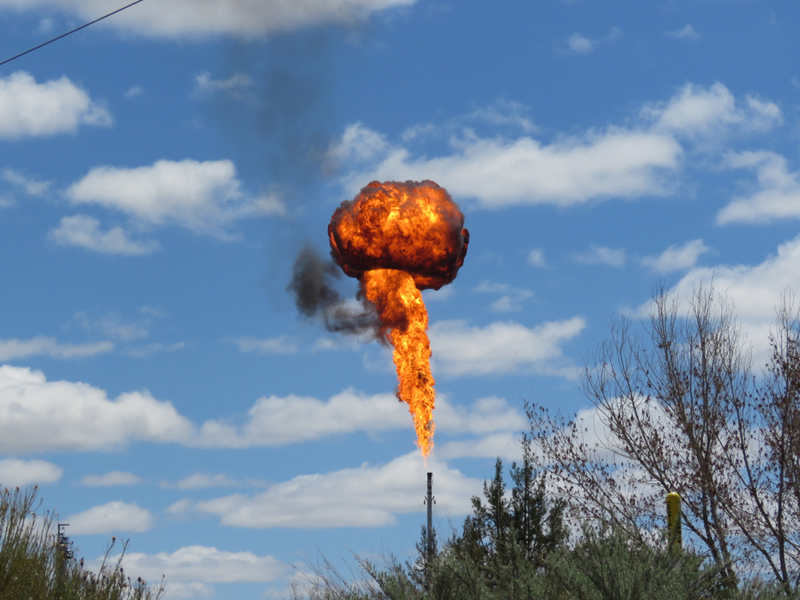 The act of flaring releases a variety of harmful air toxics. Many of these pollutants are well documented to cause long and short-term health impacts. “We plan additional studies to look at the role of flaring on the health of the local communities in the Eagle Ford, in particular pregnant women and babies. ” said Jill Johnston. This research was supported by NIH/NIEHS R21ES028417. NEW RESEARCH: Does air pollution make teens eat fattening foods? New research from our Center investigators suggests that early exposure to traffic pollution may be linked to unhealthy diet in adolescence. “Strange as it may seem, we discovered kids in polluted communities ate more fast food than other kids,” said Zhanghua Chen, a postdoctoral research associate in the department of preventive medicine at the Keck School of Medicine of USC, and the study’s first author. Researchers, staff, and interns from the USC Environmental Health Centers attended the 9th annual Environmental Health Leadership Summit of 2018 on October 18-19 in Heber, CA, a small community in the southern part of the Imperial Valley. The annual summit is hosted by Comite Civico del Valle, an environmental justice organization based in the Brawley, CA. Every year, CCV hosts various researchers, state and local agencies, community members, and community organizations share the air pollution mitigation efforts of all parties involved. The annual event is an opportunity for folks to share their projects and tackle environmental justice issues that affect communities in the Imperial Valley and beyond. Air pollution has become a hot topic in the Imperial Valley due to the frequency of dust storms and bad air quality days that affect this agricultural region. Nearby, the Salton Sea has emerged into the spotlight after years of drought and a decrease in water availability has led to much of the shoreline drying out and leaving behind fine, toxic dust. This year’s focus was on the various air pollution mitigation efforts made possible by the CA assembly bill, AB617 and the various agencies and stakeholders involved. The first day of the Summit consisted of presentations from the California Air Resources Board and from a couple project leaders regarding the establishment of a CAMN (community air monitoring network) in the Imperial Valley. Presenters also talked about the assembly bill and the process that went into selecting the 10 communities that have become the focal point of the bill. Through a series of workshops, the agency presented attendees with information on topics such as new air monitoring tools, the community engagement aspect of the bill, and data resources among others. Day 2 of the Summit was centered around the air monitoring efforts taking place in the Imperial Valley. In the first panel, various health professionals presented on their research projects taking place in communities surrounding the Salton Sea and the effects that this large body of water has on the health of nearby inhabitants, especially children. USC investigator, Dr. Jill Johnston gave a brief presentation on the AIRE study which looks at the respiratory health of children living in the Northern part of the Imperial Valley. Following this presentation, the youth environmental health leadership interns talked about their experiences participating in the program and their efforts in meeting with legislators in Sacramento. The rest of the afternoon followed with more panels that discussed air pollution mitigation efforts across the Imperial Valley and in the eastern Coachella Valley. Guests were able to ask questions throughout each session and network with presenters and other attendees during breaks. AIRE study staff and student workers ready to talk to attendees about our work. Dr. Farzan and student workers ready to answer questions. Community member looking at our pesticide infographic. Dr. Farzan explains the AIRE study to a community member. Dr. Farzan is introduced by the mayor of Brawley, Mr. George Nava. Dr. Johnston presents the AIRE study during the Health Disparities panel. The Health Disparities panel answers questions from audience members about their research. Toddlers with asthma are more likely to become obese children, according to a big international study led by USC scientists. 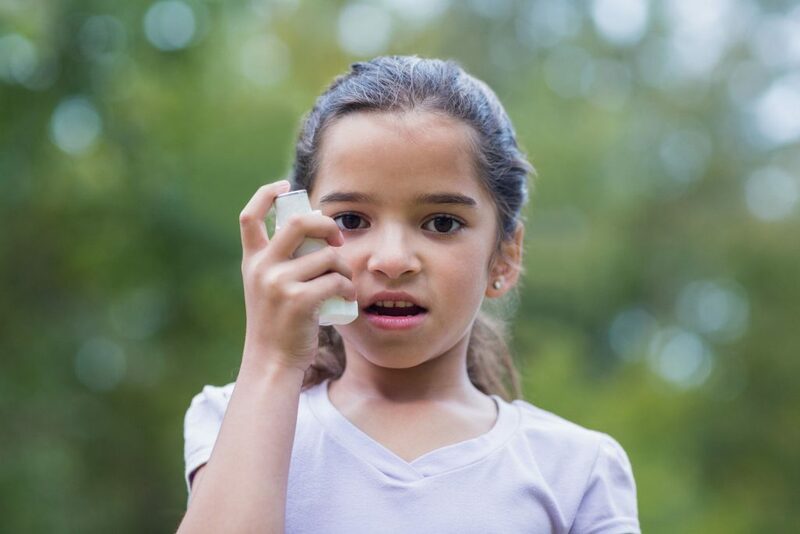 The finding is a turnabout for children’s health as obesity has often been seen as a precursor to asthma in children, not the other way around. The study, conducted by a team of 40 scientists including researchers at the Keck School of Medicine of USC, was recently published in the European Respiratory Journal.